NASA's High Resolution Coronal Imager, or Hi-C, captured the highest-resolution images ever taken of the sun's corona in the extreme ultraviolet wavelength. See full image. Image: NASA. A telescope launched July 11 aboard a NASA sounding rocket has captured the highest-resolution images ever taken of the Sun's million-degree atmosphere called the corona. The clarity of the images can help scientists better understand the behavior of the solar atmosphere and its impacts on Earth's space environment. "These revolutionary images of the Sun demonstrate the key aspects of NASA's sounding rocket program, namely the training of the next generation of principal investigators, the development of new space technologies, and scientific advancements," said Barbara Giles, director for NASA's Heliophysics Division at NASA Headquarters in Washington. Launched from White Sands Missile Range in New Mexico, the 58-foot-tall sounding rocket carried NASA's High Resolution Coronal Imager (Hi-C) telescope. Weighing 464 pounds, the 10-foot-long payload took 165 images during its brief 620-second flight. 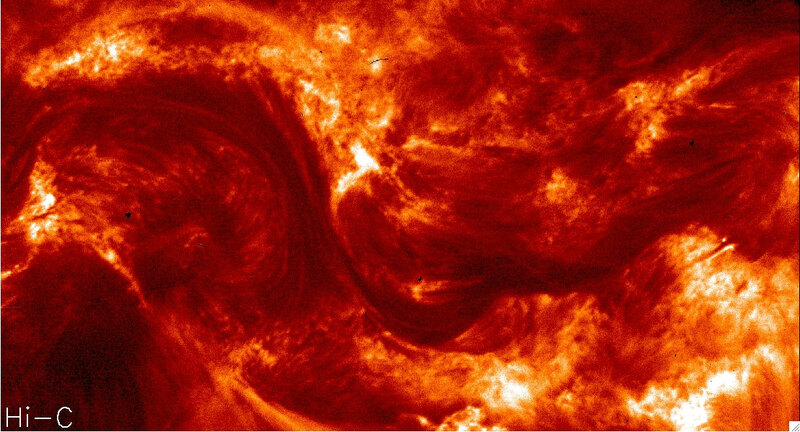 The telescope focused on a large active region on the Sun with some images revealing the dynamic structure of the solar atmosphere in fine detail. These images were taken in the extreme ultraviolet wavelength. This higher energy wavelength of light is optimal for viewing the hot solar corona. "We have an exceptional instrument and launched at the right time," said Jonathan Cirtain, senior heliophysicist at NASA's Marshall Space Flight Center in Huntsville, Ala. "Because of the intense solar activity we're seeing right now, we were able to clearly focus on a sizeable, active sunspot and achieve our imaging goals." The telescope acquired data at a rate of roughly one image every 5 seconds. Its resolution is approximately five times more detailed than the Atmospheric Imaging Assembly (AIA) instrument flying aboard NASA's Solar Dynamics Observatory (SDO). For comparison, AIA can see structures on the Sun's surface with the clarity of approximately 675 miles and observes the Sun in 10 wavelengths of light. Hi-C can resolve features down to roughly 135 miles, but observed the Sun in just one wavelength of light. The high-resolution images were made possible because of a set of innovations on Hi-C's optics array. Hi-C's mirrors are approximately 9 1/2 inches across, roughly the same size as the SDO instrument's. The telescope includes some of the finest mirrors ever made for space-based instrumentation. The increase in resolution of the images captured by Hi-C is similar to making the transition in television viewing from a cathode ray tube TV to high definition TV. Initially developed at Marshall, the final mirror configuration was completed with inputs from partners at the Smithsonian Astrophysical Observatory (SAO) in Cambridge, Mass., and a new manufacturing technique developed in coordination with L-3Com/Tinsley Laboratories of Richmond, Calif. The high-quality optics were aligned to determine the spacing between the optics and the tilt of the mirror with extreme accuracy. Scientists and engineers from Marshall, SAO, and the University of Alabama in Huntsville worked to complete alignment of the mirrors, maintaining optic spacing to within a few ten-thousandths of an inch. NASA's suborbital sounding rockets provide low-cost means to conduct space science and studies of Earth's upper atmosphere. In addition, they have proven to be a valuable test bed for new technologies for future satellites or probes to other planets. Launched in February 2010, SDO is an advanced spacecraft studying the Sun and its dynamic behavior. The spacecraft provides images with clarity 10 times better than high definition television and provides more comprehensive science data faster than any solar observing spacecraft in history.